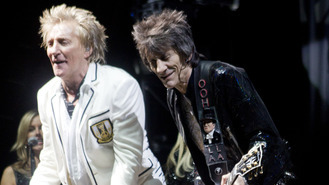 According to Rod’s wife Penny Lancaster, the 71-year-old rocker and Rolling Stones legend Ronnie catch up often. “Ronnie and Rod are very close and like peas in a pod - it’s incredible when they get together - they sort of morph into one person!” Penny told Britain’s Closer magazine. Ronnie, 69, recently extended his family further when wife Sally Humphreys, 38, gave birth to their twins Gracie and Alice in May (16). Penny and Rod have yet to meet the babies, but are more than excited about the prospect. And Penny adds that she is thrilled Ronnie and Sally were on the same page when it came to having children. As well as their own children, Penny and Rod are kept busy with their respective careers. And with Rod’s success showing no sign of waning, Penny shares that her other half has no intention of hanging up his microphone.